Reptile’s House was founded by Giancarlo Nevola in 1984. He loved the idea to create belts and leather accessories for women and men attentive to the trends and fashion. The distinctive qualities of the collections are attention to details, choice of high-quality materials and Italian craftsman knowledge. A few years later Giancarlo Nevola decided to create a collection of womans bags. The starting point was to experiment different precious leathers and innovative techniques of skin coloring, with the manufacture process totally carried out in our laboratories in Milan. glamorous and modern handbag collection, just like the target customers of Reptiles House. 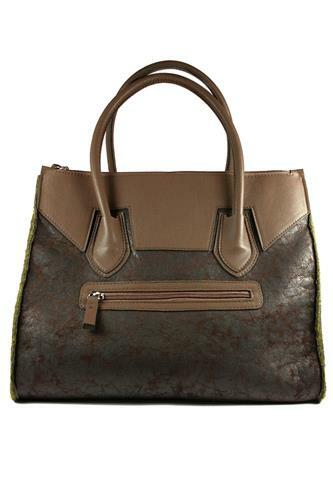 Reptile’s House Ambra bag made of scratched leather and leather. Zip closure, interior zip pocket and double mobile phone pocket. Adjustable shoulder strap. Completely handmade by craftsman in Italy. The accurate choice of the combined materials and the extreme care of the manufacture guarantee the high quality of this product. Please note that each type of shade and color graduation are wanted particular characteristics and benefits of genuine hadcraft and in no case defcts of the material or reason for complaint.